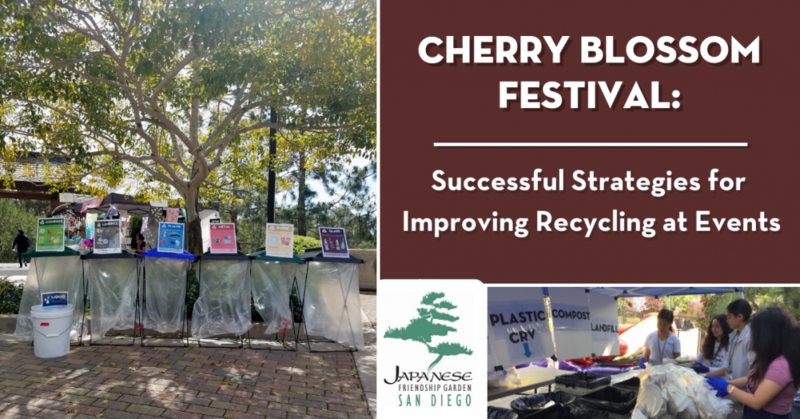 After benchmarking the recycling and waste at the Japanese Friendship Garden’s Cherry Blossom Festival in 2018, we were excited to work with their staff to put sustainability efforts into action at this year’s event. We specifically focused on “waste diversion” – the practice of reducing how much trash you send to the landfill by increasing how much you recycle or finding new and innovative ways to produce less waste. During our waste study in 2018, we worked with a group of volunteers to collect data and record the kinds of trash and recycling that were thrown away at the event. 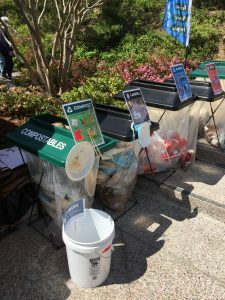 Using that information, we suggested ways that the staff at the Japanese Friendship Garden could work to prevent some kinds of waste from being created and inform visitors on how to correctly recycle at the event. We also completed an additional waste study during this year’s 3 day event to help us see the effectiveness of these strategies. We set up five “multi-bin” stations in high traffic areas of the event, instead of the usual “paired” bins that have one recycling bin and one trash bin. The multi-bin station included six bins with detailed signs, labeled landfill, compost, metal, plastic, paper, and glass. We also included a separate bucket for visitors to dump their liquids into as an additional way to prevent recyclable items, especially paper, from becoming contaminated and unrecyclable. By providing separated bins with signage, our goal was to inform visitors about what items should or should not be recycled and to make the process of sorting and recording data for our waste study more efficient. The signs placed with the bins used pictures of what the vendors would be selling at the event so visitors could identify what bin their trash should be put in. 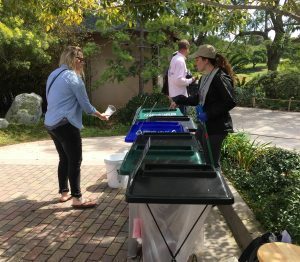 We also had clear bags and wire framed waste bins so guests could see what items were already placed in the bin and the amount of waste, compostables, and recyclable material types generated at this event. For our multi-bin stations, we recruited a group of 32 volunteers to help visitors place their waste, compostables, and recyclables in the correct bin. Many of these volunteers were stationed as “trash talkers”, where they interacted with visitors about waste diversion topics. This was a great opportunity to inform visitors about recycling best practices. Volunteers were trained on sorting items specific to the event so they would be prepared to give that information to the visitors they interacted with. For our waste study, volunteers also helped us sort the event’s waste to record detailed data on the type of items thrown away at the event and to see how successful our waste diversion strategies were. This was a huge undertaking; overall, 234 bags of trash and recycling were sorted, weighing 1,987 pounds! Plastic film items, such as single-use shopping bags and flexible wrapping used for packaging, can’t be placed in a normal recycling bin. 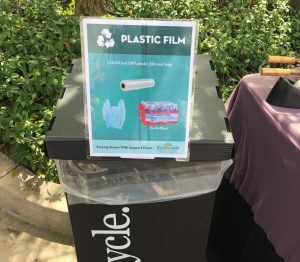 To collect plastic film from this event, we provided a separate bin for vendors to place their plastic film. The plastic film was taken to a designated plastic film recycling location, as plastic film that enters a recycling facility can damage the machinery. Social media is a great way to encourage visitors to participate in sustainable practices at an event. 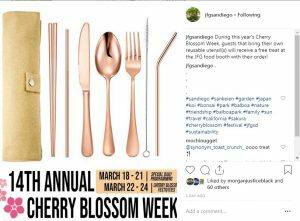 The Japanese Friendship Garden posted on their social media to encourage visitors to bring reusable utensils in exchange for a “special treat” during the event. Many users tagged their friends on this post encouraging each other to use reusable utensils at the event. These strategies helped to increase waste diversion, reduce recycling contamination, and informed visitors on recycling best practices. Using the information we gathered at this event, we’re excited to share our lessons learned with other organizations in Balboa Park to make future events more sustainable! 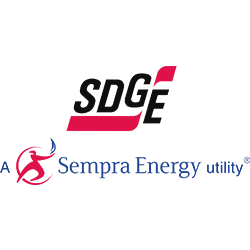 Our work at the event would not have been possible without supplies and support from our partners at the City of San Diego, County of San Diego Department of Public Works, I Love a Clean San Diego, Republic Services, and Gorilla Services.